If you have pet betta fish, you may be looking for a sweet tank to hold your baby. It can be difficult to find a great betta tank, so we took all of the guesswork out of finding the best tank for a betta. We compiled a list of all of our favorite betta tanks and made a top ten list of all of them that we researched and reviewed. Here’s a list of some of the things we looked for when compiling our top ten; they helped us to find great betta tanks, and they can help you too! 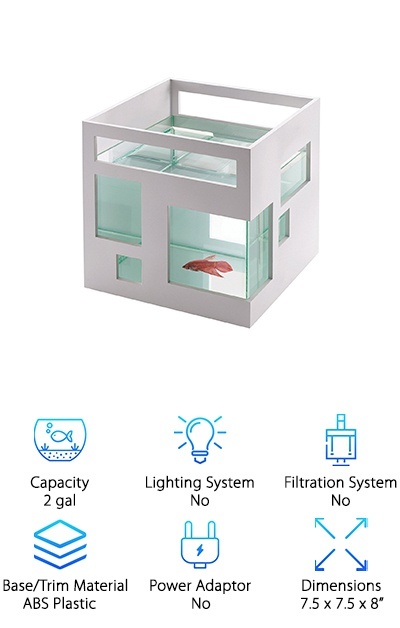 Capacity - If you are looking for the best tank for betta fish that you own, you’ll want to make sure your little fishy friends have enough room to swim around. Lighting System - Do you want a lighting system for your betta fish? We’ll let you know if each tank will come with a lighting system or if you will have to buy one separately. Filtration System - Some tanks come with filtration systems and some don’t. Not all tanks need a filter, but it can help cut down on tank cleaning time for you. Base/Trim Material - Tanks are made predominantly of glass, but what are the base and trim made from? We’ll let you know what they are made of, whether it's metal or plastic. Power Adapter - Does it come with a power adapter? If a filter or lighting system is included, there will most likely be an adaptor included with the package. Dimensions - Make sure you have enough room for the tank in your home and that the tank is big enough for your betta. This will be measured in inches. Now that we’ve covered those important stats, let’s get ready for the list of the top ten best betta tanks! We’ve compiled a list of our ten favs, and they are all great choices. However, there were two on the list that really stood out from the rest. The first is listed as number one on this list, and it’s our Top Pick. It was our absolute favorite out of all ten. The second is our Budget Pick which was our favorite, inexpensive betta tank for those of you on a budget. If you are in a hurry, be sure to check out those two at least! Now, let’s get to those best betta fish tank reviews. The Marineland Contour Aquarium Kit is a complete kit that’s ready for your betta! 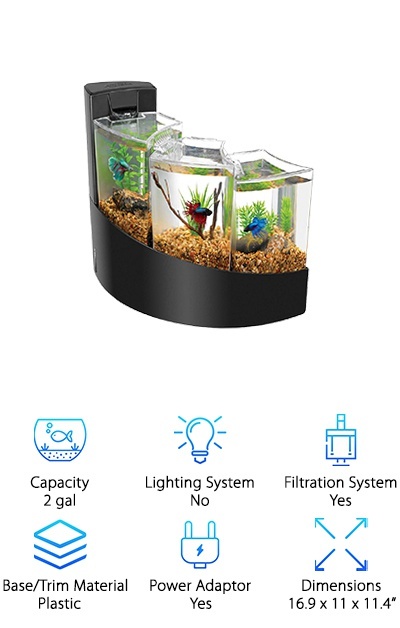 We think this is the best tank for betta fish around, and for good reason! The aquarium is made from contoured glass that gives you a complete view of your fish. It is covered to help get rid of evaporation, which is imperative in a small tank. It’s incredibly simple to set up and get going, and it’s even easier to clean. Also, this tank comes with a lighting system that has a daylight and a moonlight setting for you and your fishy friends. But the coolest part of this amazing tank is the 3-step filtration system. There are three different kinds of filters (chemical, bio and mechanical), all designed to help keep your tank as clean as possible! Looking for the best fish tank for betta on a budget? We’re pretty sure that we’ve found it! 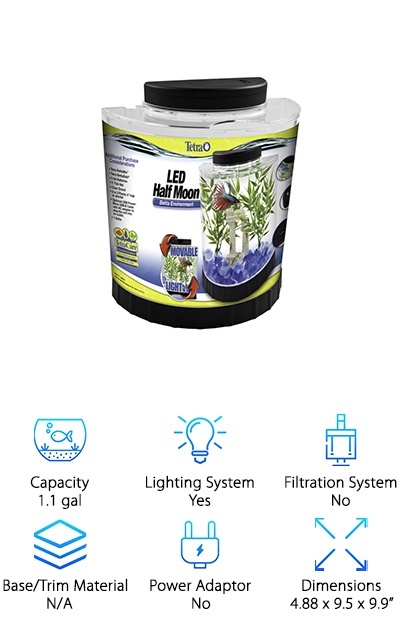 The Tetra LED Half Moon Aquarium comes with everything we want in a tank but without the big price tag. The LED light can fit either above or below the tank, giving you the ability to customize the tank a little. The lid keeps the water covered while still having a convenient feed hole for your fishy buddies. Although it doesn’t have a filtration system, the tank is super easy to clean. And the tank is made from super clear acrylic so you can see all of your fish swimming happily around in their new home. Our favorite part of this tank is that the lighting is potentially cordless; it is powered by either 3AA batteries or by a mini USB cable (not included). The Fluval Spec V Aquarium Kit is a great way to display your favorite fish! The front and back of the aquarium are clear, giving you the best view of your little pets. 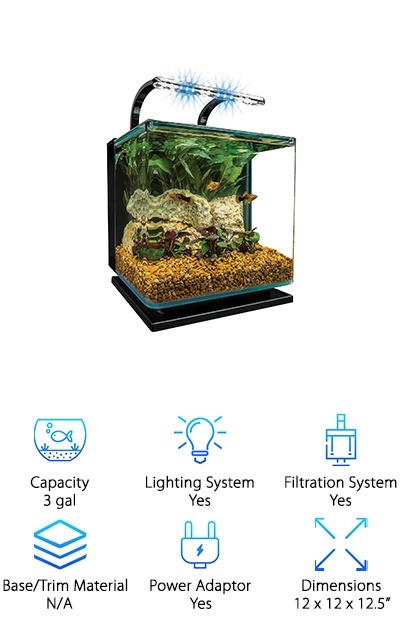 This tank holds up to 5 gallons of water, making it great for betta or other small fish. The trim of the tank is durable aluminum, and the rest is glass, making for a strong and long-lasting tank. The lighting system is super bright and top notch; it contains 37 LED lights to help keep your fish in the light. It has a filtration system that helps to keep your tanks as clean as possible while making less work for you. Once you add a heating system to this tank, it becomes the best tank for betta in our opinion. And a bonus feature: this thing is shallow enough to sit on desks, countertops, or other small spaces. Looking for a more contemporary look for your fish? The Umbra FishHotel is a fish tank so fashionable that you’ll be jealous. Styled after modern, sleek condos, the design is fun and functional. You can even stack FishHotels to build yourself a fun, fishy condo! These little homes are great for your goldfish, bettas, or other small fish that want to live alone. The plastic outer casing can be painted to match your decor or removed for easy cleaning. Although it doesn’t come with a filter, lighting, or a heater, it’s still one of the coolest-looking betta tanks we’ve ever seen. And you can definitely add all of these things if your fish need them. So if you want a cute little home for your pets, check out the Umbra FishHotel! The Tetra Betta Bubble Bowl is a truly tiny bowl that’s great for dorms, small apartments, and tiny homes with little space to spare. If you want a small space for your little fish to swim in, this is great, inexpensive way to home them. The glass on this bowl is very clear, giving you a great view of your fish. There is a built-in LED light that runs off of batteries. The lid covers the water to protect the water against evaporation, but it leaves a small opening for convenient feeding. This little tank is quick and easy to clean, making it great for busy folks who just want an easy-to-care-for pet. 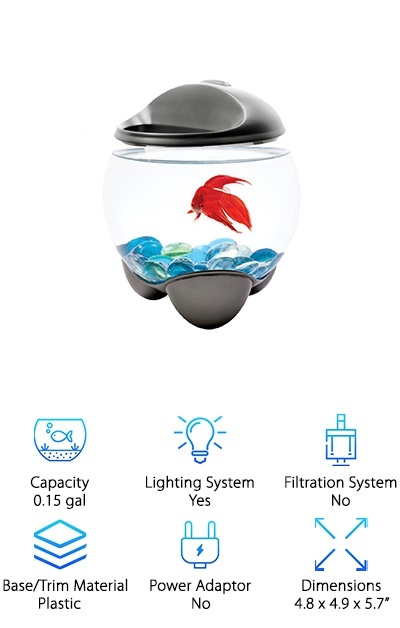 So check out the Tetra Betta Bubble Bowl for your tiny space! Want a 360-degree view of your fish? The KollerCraft AquaView Kit gives you a clear, lit up view of your fishy friends while the swim and play. This 2-gallon tank is small but not too small for your bettas. 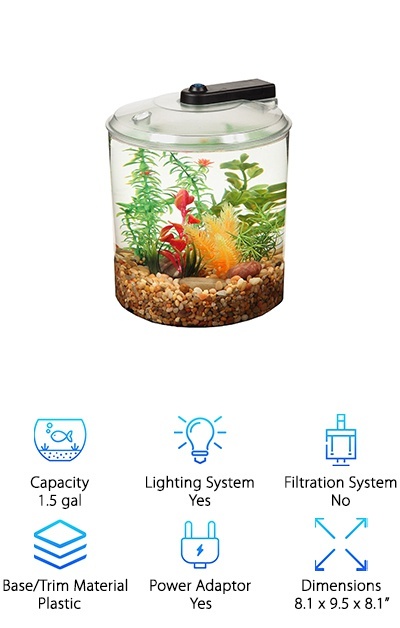 It has a little filter too, making sure to keep the water for your bettas a clean as possible. The energy-efficient lights can be set to a variety of different colors. This kit really includes everything you need to get started with a new fish or an old friend. And the best part? The super clear acrylic outside is safe for kids and impact resistant. So if you have young kids, move a lot, or are kind of clumsy yourself, the KollerCraft AquaView Kit is a great option for you! Want a small tank that’s big on style? 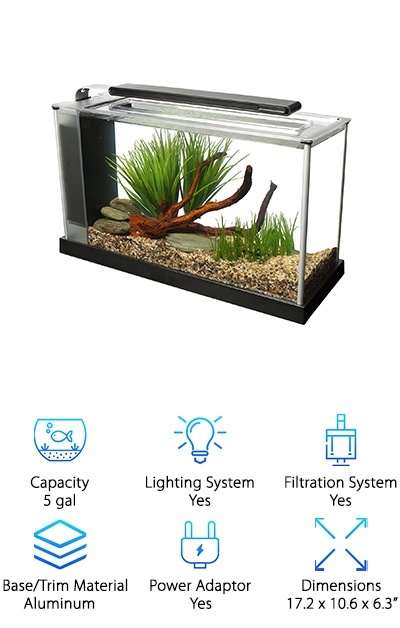 The Penn Plax Aquarium Kit holds just under three gallons of water. It’s made of curved glass, giving you a full view of all of the tanks’ residents. It’s perfect for anyone who wants to get started with any small fish or shrimp. You even get a small filter to keep your new friend’s house clean! The lid covers the water, keeping your fish safe while hinged for feeding. The water filter hangs on the top of the tank, making sure not to obscure your view. The tank is only about 10 by 8 by 9 inches, making it quite small. 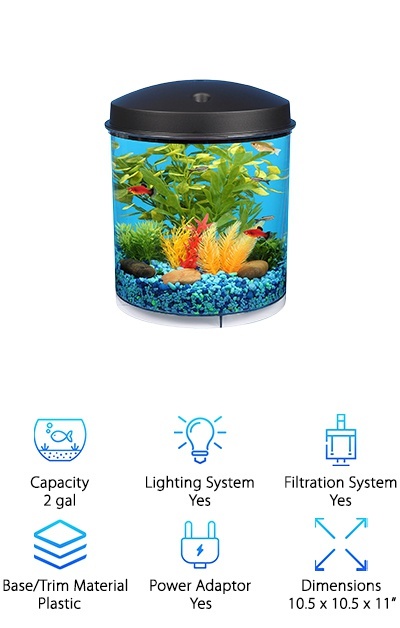 If you don’t have a lot of space, this is a great tank for your new fish. And we love how inexpensive this kit is! This tank is as soothing and beautiful as your pet bettas are! The Aqueon Kit Betta Falls is a breathtaking, waterfall of sound and sights. With three different compartments, you can have three different fish. Each segment is coated with frosted panels to ensure your bettas can’t see each other. The filter keeps the water flowing while keeping all the water as crystal clear as possible. The plastic base comes in both white and black to help match your decor. It’s beautifully curved and looks spectacular anywhere you put it! This tank is about 17 by 11 by 11.4 inches, so it is small enough for most homes. And this tank is great for soothing sounds and meditation too! So if you want a pretty and functional tank, check out the Aqueon Kit Betta Falls! Looking for something a little more eco-friendly? 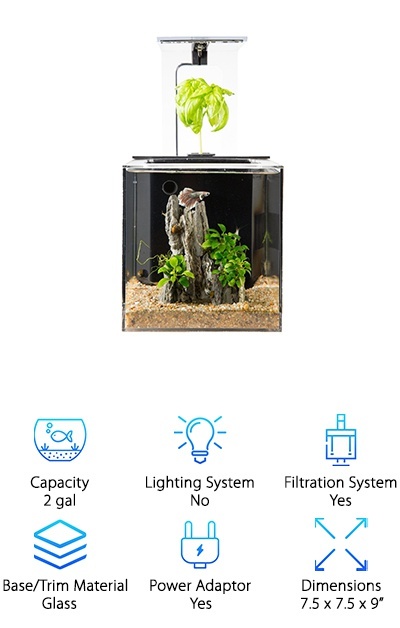 The EcoQube Desktop Betta Fish Tank is a great way to get started in the awesome, environmentally-friendly world of aquaponics. What is aquaponics, you ask? It’s all about putting organisms that work well together in the same place. Your fish makes a perfect environment to grow some edible plants, while the plants make a better home for your fish. This symbiosis ensures you have a great home for your fish and a plant for you to eat as well! 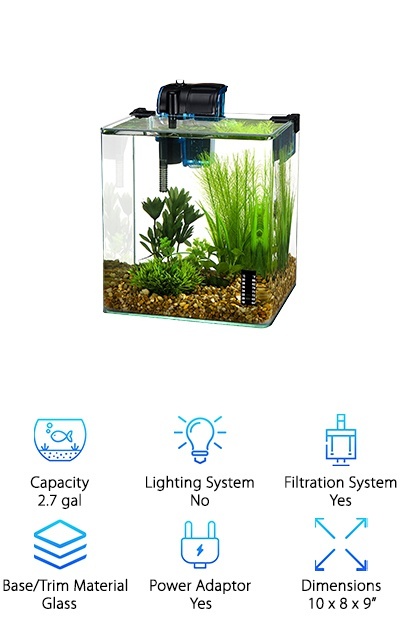 With your EcoQube Desktop Betta Fish Tank, you also get a remote, an integrated aquaponic filter, the phone app, an optional UV sterilizer, and everything you need to get started in aquaponics! This beautiful tank makes for a great gift too! Want an aquarium that is backed by a two-year warranty? The Api Betta Kit is a great, small tank for your betta or other fish. It’s awesome for a small space or kids room. The tank is made from a durable plastic that is seamless, giving you a 360-degree view of your fish. This tank is brightly lit; the lighting system is made from seven LED lights that really brighten up your tank. The lights can shine in a variety of different colors too! They run off of AA batteries or a small power adaptor. And it even includes some stress coat and betta food to help get you started with your new pet! So if you are looking for a great deal on a small, round betta home, the Api Betta Kit is a great place to start looking!